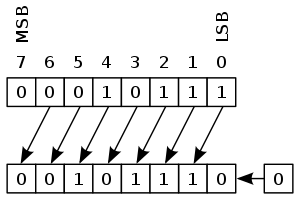 A right arithmetic shift of a binary number by 1. The empty position in the most significant bit is filled with a copy of the original MSB. 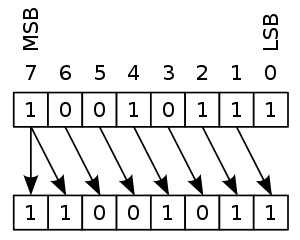 A left arithmetic shift of a binary number by 1. The empty position in the least significant bit is filled with a zero. In computer programming, an arithmetic shift is a shift operator, sometimes termed a signed shift (though it is not restricted to signed operands). The two basic types are the arithmetic left shift and the arithmetic right shift. For binary numbers it is a bitwise operation that shifts all of the bits of its operand; every bit in the operand is simply moved a given number of bit positions, and the vacant bit-positions are filled in. Instead of being filled with all 0s, as in logical shift, when shifting to the right, the leftmost bit (usually the sign bit in signed integer representations) is replicated to fill in all the vacant positions (this is a kind of sign extension). Some authors prefer the terms sticky right-shift and zero-fill right-shift for arithmetic and logical shifts respectively. Arithmetic shifts can be useful as efficient ways to perform multiplication or division of signed integers by powers of two. Shifting left by n bits on a signed or unsigned binary number has the effect of multiplying it by 2n. Shifting right by n bits on a two's complement signed binary number has the effect of dividing it by 2n, but it always rounds down (towards negative infinity). This is different from the way rounding is usually done in signed integer division (which rounds towards 0). This discrepancy has led to bugs in more than one compiler. For example, in the x86 instruction set, the SAR instruction (arithmetic right shift) divides a signed number by a power of two, rounding towards negative infinity. However, the IDIV instruction (signed divide) divides a signed number, rounding towards zero. So a SAR instruction cannot be substituted for an IDIV by power of two instruction nor vice versa. A shift, applied to the representation of a number in a fixed radix numeration system and in a fixed-point representation system, and in which only the characters representing the fixed-point part of the number are moved. An arithmetic shift is usually equivalent to multiplying the number by a positive or a negative integral power of the radix, except for the effect of any rounding; compare the logical shift with the arithmetic shift, especially in the case of floating-point representation. An important word in the FS 1073C definition is "usually". Arithmetic left shifts are equivalent to multiplication by a (positive, integral) power of the radix (e.g., a multiplication by a power of 2 for binary numbers). Arithmetic left shifts are, with one exception, identical in effect to logical left shifts. Arithmetic shifts may trigger arithmetic overflow whereas logical shifts do not. This exception matters only if a trigger signal for such an overflow is needed. However, arithmetic right shifts are major traps for the unwary, specifically in treating rounding of negative integers. For example, in the usual two's complement representation of negative integers, −1 is represented as all 1's. For an 8-bit signed integer this is 1111 1111. An arithmetic right-shift by 1 (or 2, 3, …, 7) yields 1111 1111 again, which is still −1. This corresponds to rounding down (towards negative infinity), but is not the usual convention for division. It is frequently stated that arithmetic right shifts are equivalent to division by a (positive, integral) power of the radix (e.g., a division by a power of 2 for binary numbers), and hence that division by a power of the radix can be optimized by implementing it as an arithmetic right shift. (A shifter is much simpler than a divider. On most processors, shift instructions will execute faster than division instructions.) Large number of 1960s and 1970s programming handbooks, manuals, and other specifications from companies and institutions such as DEC, IBM, Data General, and ANSI make such incorrect statements [page needed]. Logical right shifts are equivalent to division by a power of the radix (usually 2) only for positive or unsigned numbers. Arithmetic right shifts are equivalent to logical right shifts for positive signed numbers. Arithmetic right shifts for negative numbers in N−1's complement (usually two's complement) is roughly equivalent to division by a power of the radix (usually 2), where for odd numbers rounding downwards is applied (not towards 0 as usually expected). Arithmetic right shifts for negative numbers are equivalent to division using rounding towards 0 in one's complement representation of signed numbers as was used by some historic computers, but this is no longer in general use. In applications where consistent rounding down is desired, arithmetic right shifts for signed values are useful. An example is in downscaling raster coordinates by a power of two, which maintains even spacing. For example, right shift by 1 sends 0, 1, 2, 3, 4, 5, … to 0, 0, 1, 1, 2, 2, …, and −1, −2, −3, −4, … to −1, −1, −2, −2, …, maintaining even spacing as −2, −2, −1, −1, 0, 0, 1, 1, 2, 2, … In contrast, integer division with rounding towards zero sends −1, 0, and 1 all to 0 (3 points instead of 2), yielding −2, −1, −1, 0, 0, 0, 1, 1, 2, 2, … instead, which is irregular at 0. ^ The >> operator in C and C++ is not necessarily an arithmetic shift. Usually it is only an arithmetic shift if used with a signed integer type on its left-hand side. If it is used on an unsigned integer type instead, it will be a logical shift. ^ The Verilog arithmetic right shift operator only actually performs an arithmetic shift if the first operand is signed. If the first operand is unsigned, the operator actually performs a logical right shift. ^ In Scheme arithmetic-shift can be both left and right shift, depending on the second operand, very similar to the OpenVMS macro language, although R6RS Scheme adds both -right and -left variants. ^ The VHDL arithmetic left shift operator is unusual. Instead of filling the LSB of the result with zero, it copies the original LSB into the new LSB. While this is an exact mirror image of the arithmetic right shift, it is not the conventional definition of the operator, and is not equivalent to multiplication by a power of 2. In the VHDL 2008 standard this strange behavior was left unchanged (for backward compatibility) for argument types that do not have forced numeric interpretation (e.g., BIT_VECTOR) but 'SLA' for unsigned and signed argument types behaves in the expected way (i.e., rightmost positions are filled with zeros). VHDL's shift left logical (SLL) function does implement the aforementioned 'standard' arithmetic shift. ^ The C standard was intended to not restrict the C language to either ones' complement or two's complement architectures. In cases where the behaviours of ones' complement and two's complement representations differ, such as this, the standard requires individual C compilers to document the behaviour of their target architectures. The documentation for GNU Compiler Collection (GCC), for example, documents its behaviour as employing sign-extension. ^ Thomas R. Cain and Alan T. Sherman. "How to break Gifford's cipher". Section 8.1: "Sticky versus Non-Sticky Bit-shifting". Cryptologia. 1997. ^ Steele Jr, Guy. "Arithmetic Shifting Considered Harmful" (PDF). MIT AI Lab. Retrieved 20 May 2013. ^ Hyde 1996, § 6.6.2.2 SAR. ^ ISOIEC9899 1999, § 6.5.7 Bitwise shift operators. ^ FSF 2008, § 4.5 Integers implementation. Knuth, Donald (1969). The Art of Computer Programming, Volume 2 — Seminumerical algorithms. Reading, Mass. : Addison-Wesley. pp. 169–170. Steele, Guy L. (November 1977). "Arithmetic shifting considered harmful". ACM SIGPLAN Notices archive. New York: ACM Press. 12 (11): 61–69. doi:10.1145/956641.956647. "3.7.1 Arithmetic Shift Operator". VAX MACRO and Instruction Set Reference Manual. HP OpenVMS Systems Documentation. Hewlett-Packard Development Company. April 2001. Archived from the original on 2011-08-08. "Programming languages — C". ISO/IEC 9899:1999. International Organization for Standardization. 1999. Hyde, Randall (1996-09-26). "CHAPTER SIX: THE 80x86 INSTRUCTION SET (Part 3)". The Art of ASSEMBLY LANGUAGE PROGRAMMING. Archived from the original on 2007-11-23. Retrieved 2007-11-28. "C Implementation". GCC manual. Free Software Foundation. 2008. This page was last edited on 22 April 2019, at 20:39 (UTC).